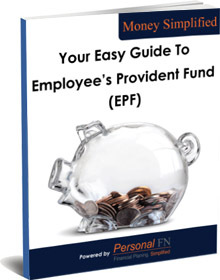 PersonalFN is pleased to present to you the Easy Guide to the Employees' Provident Fund - all your EPF questions answered in one place! In this Guide you will learn all you want to know about the EPF and how to use it to achieve your life goals! Where does your EPF contribution go? To get this guide immediately, simply enter your details below and the guide will reach your mailbox shortly. This is an entirely free service. No payments are to be made. As soon as you sign up, you will also receive our free newsletter - Financial News. Simplified.